With the Stradivari Franco Serblin completed the Homage trilogy. 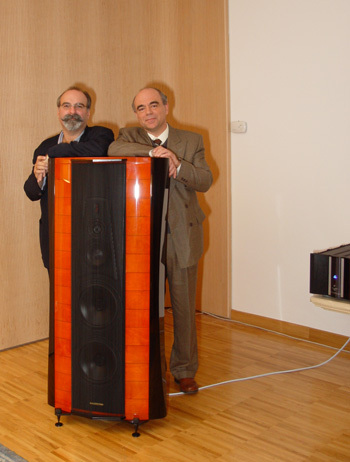 Like Hercules, after having performed the twelve labours, Serblin, who has founded one of the most important audio shrines in Arcugnano - the Ara Maxima Serblins - and is also rightfully considered a demigod in the international audio community, was finally given a chance to sit back and enjoy the glory of his many technical achievements. 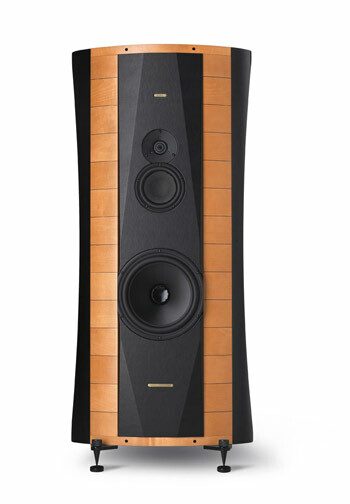 The glorious Stradivari, the mother of all Sonus Faber speakers. The Stradivari is without any doubt Elipsa's mother - one can only agree with this assessment just by looking at both - but for once Franco is not the father of the child, Paolo is. In this story Franco plays the role of the grandfather, who provides a respected family name, good genes, a happy home, the knowledge and extensive experience without which this beautiful and gifted baby could not have been procreated in such a short time. 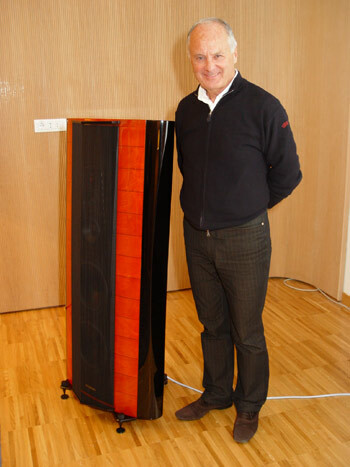 'Elipsa is the very first project that wasn't designed and developed by Franco Serblin, but it is the 'choral' result of Sonus Faber's inner young resources: a new R&D team of which I am the coordinator'. When I first saw the Elipsa at the Venetian in Las Vegas I feared the Stradivari had undergone a Lilliputian shrinkage process to avoid heavy customs duties. The room was also huge and that made it look even smaller than I could remember from previous encounters. 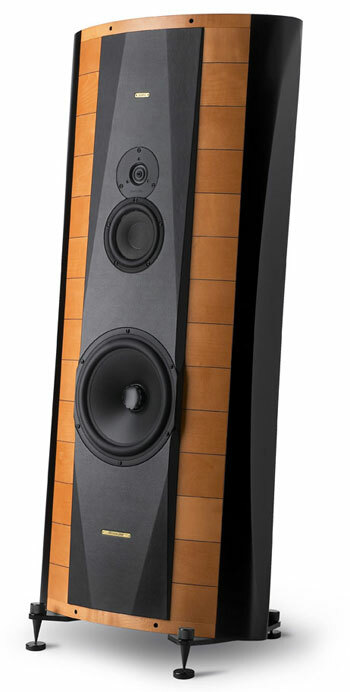 Then someone told me I was listening to the Elipsa, a new Sonus Faber project. Uff, I thought it was the jetlag playing tricks on me. 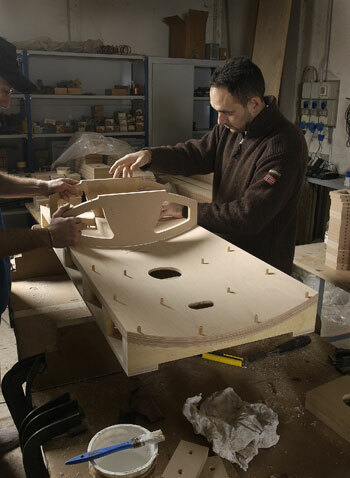 The Elipsa enclosure, both internally and externally, shares many of the construction techniques first developed for Stradivari, the most obvious being the elliptical shape, hence the name. As I once wrote in an article about the Stradivari, they look like two Amatis embracing and kissing each other. I have often been left spellbound in ecstatic delight whenever Franco kindly offered to personally grace my eyes and ears with his unique artistry and ingenuity. In November 2003, at the world anteprima in Arcugnano, I felt enraptured by the aura of divine inspiration that enveloped the appearance of that shiny, curvaceous, sensuous musical creature with a mellifluous voice. The Stradivari looked like a giant violin designed by Franco as a gift to the mighty Zeus (and the chosen ones who can pay for it). The elliptical shape was a well succeeded attempt to overcome the limitations of conventional enclosure types by mimicking the theoretical infinite plane. In practice the gently curved surface works more as a launching platform for the crucial midrange unit wave fronts, adding body and substance to the sound by avoiding phase-y artifacts due to diffraction and the secondary reflections delay pattern, than a true 'infinite baffle' for the powerful bass unit below considering the long wavelengths involved. 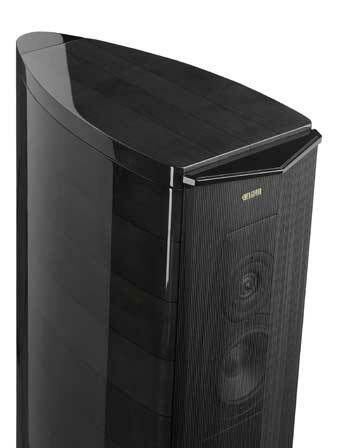 Nevertheless the curved and shallow body does have an important role in the way the speaker interacts with the room, inhibiting to a more acceptable degree the ugly appearance of dips and peaks in the bass response and the boominess that often arises from conflicting eigenmodes. But I shall dwell no longer on this otherwise interesting technical matter, which can be read elsewhere, for at the outset this article was supposed to be just a preview not the full test it threatens to turn into, no doubt driven by my sheer enthusiasm and bare attempts to be on par with the subject of my analysis. For the sake of economy (and reader's patience) let's rather focus on the differences between mother and daughter. 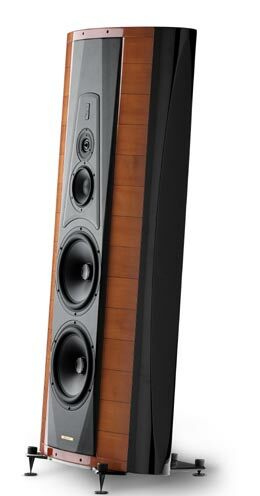 The size for one, and the weight too: the Elipsa is some 11 cm shorter, 10 cm thinner, just 5 cm shallower, and a substantial 26Kg lighter, all that at roughly half the price (this being the only circumstance I dare to use the adjective rough when referring to such a beautifully crafted loudspeaker). The Elipsa is thus easier to accommodate both physically and financially and, certainly not the least, also easier to move around than the massive, yet exquisitely elegant, Stradivari. By rotating it on one spike at a time, it is a cinch to put it in its right place without stressing your back. The integral driver baffle is covered with the brand traditional black leather composite, and the stylish contour intended to control diffraction resembles that of the Amati. Since I unavoidably had to stare at it for the long hours of listening pleasure (the string grille, although artistic and full of craftsmanship symbolism is better left in the box, unless you or your wife want to impress a non-audiophile friend) it occurred to me the baffle looked like a bassorelievo of the prismatic shape that distinguishes Avalon speakers from the herd. 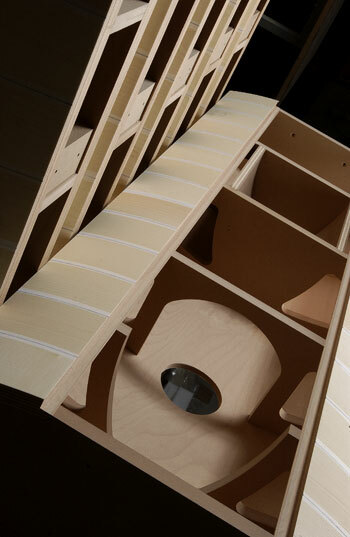 The Elipsa does not feature the decoupled sub-enclosure for the mid-high section which ingenuously bridges the front and rear faces of both the Stradivari and Amati Anniversario transferring harmonic energy in a way analogous to the anima in a violin. But it has kept theanimaintact. And it certainly is a speaker with a great soul: meaning it has not only anima but stamina too . 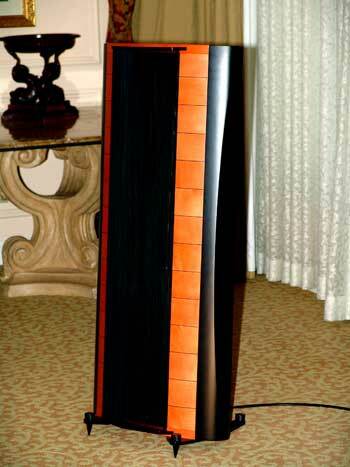 The woofer is the same pure piston SEAS woofer as used in the Stradivari only not in pairs. The 10 in. (260 mm) lightweight Aluminum/Magnesium alloy cone driver surface is damped with a ceramic material. Ultra dynamic performance and linearity are promised. Special coaxial anti-compressors are used, designed to remove cavity resonance and distortions. It sure sounds fast, articulate and clean. The 6 in. (150 mm) midrange paper cone driver with Symmetric Drive Motor System is treated with hand-selected “black wood” fibers for a more natural sound and has undergone extensive mechanical improving techniques for control of break-up. 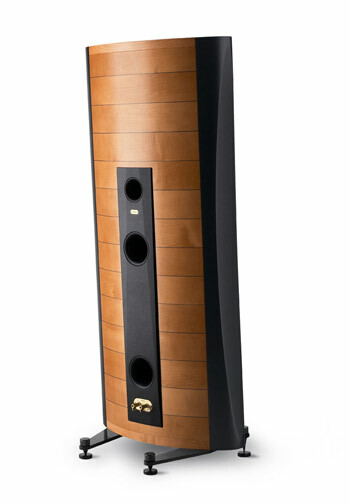 Driver features a dynamic linear suspension designed synergistically with its vented acoustic chamber tuned to 75Hz. This is a totally new version of the Scan Speak Revelator (and revealing it certainly is), designed exclusively for Sonus Faber , remaining so for at least a year. The tweeter is a special version of the famous ultra dynamic Scan-speak 25 mm silk dome ring radiator driver, with dual toroidal wave-guide, as used in the Cremona Series. 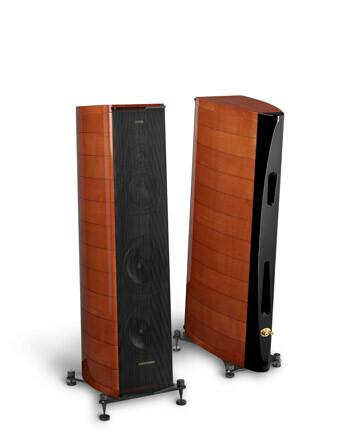 The Stradivari and the latest Homage Series speakers feature a different version with a double contour face plate, although all exhibit the same 'pointy' phase plug. Rear energy is also controlled by its own chamber to minimize self-resonance known to induce timbre coloration. 'You're right, the upper port was added to make the midrange breathe and work without any compression....in fact Elipsa sounds cleaner, faster and very natural as well....a result close to a dipole sound in that critical range of frequencies'.